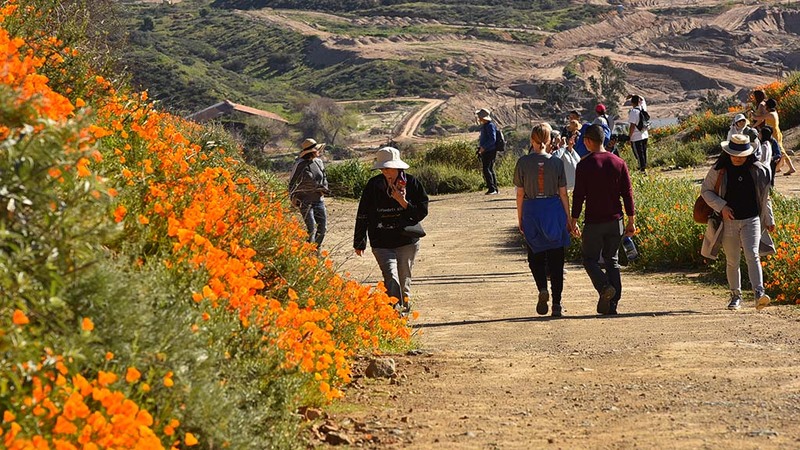 A trail temporarily closed to visitors in Lake Elsinore where stadium-sized crowds poured in over the weekend to view acres of blooming poppies, causing massive traffic headaches for law enforcement and angering locals, was reopened Monday, drawing huge crowds once again. Lake Street became what Assemblywoman Melissa Melendez, a longtime Lake Elsinore resident, compared to a parking lot, with traffic barely budging, causing side streets to become blocked. “I hear Anza-Borrego is nice,” she said suggestively in a tweet Sunday. “Pray for very targeted HEAVY RAINS this next weekend!” Jeffries wrote on his Facebook page. City of Lake Elsinore video showed crowds returning to the area Monday, but nothing on the order of a stampede along the Walker Canyon Trail. Area residents fumed in social media posts that vegetation was being needlessly trampled and not enough law enforcement resources were in place to deter motorists from taking hazardous risks to reach the location. A shuttle service was established at the Lake Elsinore Outlets to ferry visitors to the poppy fields, but that was canceled Sunday when traffic conditions became unbearable. At one point Sunday, the county’s Emergency Management Department Operations Center was activated, and personnel were requested to help coordinate with municipal officials on how to mitigate traffic congestion. The EMD has been working overtime over the last three months to ensure public safety during winter storms, with the threat of flooding, mud and debris flows on the eastern boundary of the Cleveland National Forest, just a few miles from Walker Canyon. Lake Elsinore administrators, Riverside County sheriff’s officials, the CHP and county Executive Office staff did not immediately respond to requests for comment on what preparations are underway to prevent a similar “Super Bloom” scenario from playing out this coming weekend.